Several wearers said that the Salomon S-Lab Sense 6 has an attractive design. Most of those who tried the shoe admired its lightweight construction. Some of the runners were really happy with the comfortable feel of the shoe. A couple of testers admired the quick-lacing system of the shoe that also provides added foot security. Based on some comments, the shoe is impressively durable. The shoe provides durable cushioning necessary for long-distance runs, according to a few commenters. The S-Lab Sense 6 delivers a reliable grip on both dry and wet surfaces, said some satisfied customers. One tester noted the wide forefoot of the shoe, appreciating its capacity to accommodate natural toe-splay. The shoe is very expensive, said a few purchasers. A few users wished to see more color options for the S-Lab Sense 6. A customer mentioned that the foot bed is too thin for his liking. The majority of users considered the Salomon S-Lab Sense 6 as light and durable pair of running shoe. It provides runners the right amount of cushioning, grip, comfort, and protection needed for a better off-road performance. The shoe is ideal for those who are looking for a protective yet lightweight trail running shoe. The Salomon S-Lab Sense 6 has been on my radar for some time now, and I finally decided to cave in and ordered a pair. They are the highest-ranking shoe from Salomon, as well as the highest overall trail shoe according to RunRepeat. I planned to put these shoes to use in a variety of races ranging from short trail runs to ultra marathons. When I received the shoe, I was impressed with its lightweight nature (221 grams). This is the lightest shoe of the S-Lab series. I was also surprised by how comfortable the shoe is, despite its limited padding and minimalistic design. I took the shoe on a run and was awed by the flexibility and comfort. My feet did not hurt the slightest bit after 6 miles. No break-in period was required for this shoe, unlike my Salomon S-Lab Amphibs. The Sense 6, like most Salomon shoes, uses the speed lacing system that is simple, effective, and does not loosen up during runs. Within the midsole of the Sense 6 is Salomon’s ProFeel Film, which is essentially a carbon fiber shank similar to a rock plate, but with a few added benefits. Salomon claims the ProFeel Film "engages during the transition phase to support the foot and improve the overall rolling of the shoes during toe-off." The Sense 6 runs a tad large, so I recommend buying a half size smaller than usual. The shoe has an internal fit sleeve designed to hug the foot in all the right places and improve feedback and foot wrapping. Salomon uses “sense-fit technology” to cradle the foot from the midsole to laces, provide a secure, snug, and customized fit all around the foot. I enjoy the roomy toe box and the mesh material, which allows for ventilation and drainage. However, I do think this material makes the shoe susceptible to sand getting inside. The grip of the shoe is the same as all S-Lab shoes and made of Contragrip lugs, which have a sticky grip and offer extreme traction on both wet and dry terrain. The heel height is similar to all Salomon S-Lab shoes, at the height of 18mm and a heel drop of 4mm. The outsole of the Sense 6 is designed for “hard ground” terrain. The contra-grip lugs have a height of 1-1.5mm. The upper material of the shoe is comprised of quick-drying, breathable mesh. It consists of a single layer mesh combined with nylon to allow for breathability and top abrasion resistance. Surprisingly, I found the upper material of the shoe to be durable, despite feeling somewhat delicate and lightweight. However, the mesh of the shoe is reinforced with thoughtfully placed rubberized laminate. The shoes upper allows breathability and its ability to shed water is astounding. One of the greatest features of the sense 6 and something I always look for in a shoe, is the wide toe box. Due to the minimal cushioning of the shoe, the toe box has a lot of space, which my feet are very grateful for. The toe box has an approximate 4.1inch diameter beginning at the arch of the foot. Another notable aspect of the shoe is the toe guard that protects against impact from rocks while running trails. The Salomon S-lab Sense 6 uses the traditional Salomon speed lacing system. They are very thin laces, but they have yet to come loose while on a run. The upper part of the tongue has a lacing pocket to tuck the laces in. The system is quick and efficient, however, after several uses, the adjustment tool on the lacing system became jammed consistently. I would summarize this lacing system as “good, but not great”. The heel of the shoe is minimally cushioned and does a good job at keeping debris out. The heel is also comprised of mesh and does not hold water. The Sense 6 has a very thin insole that is glued down inside the shoe, which is consistent with the minimalistic design. The Sense 6 has phenomenal flexibility due to the minimal padding. It still keeps your foot locked in while running which helps to avoid blisters. Salomon created the S-Lab series to be the first series of shoes to perform well on all terrains. Many of the shoes in this series share similar innovated features (seen here on the Run Repeat website). The Salomon Sense 6 and the 6SG are very similar in many regards especially the specifications. The main difference between the two is that the Sense 6 is designed for hard ground conditions and the 6SG is designed for soft ground conditions. The Sense 6 and the XA Amphib are both excellent trail shoes. I own both, and the main difference is that the Amphib is designed for wet, muddy trails and the Sense 6 is best suited for hard ground conditions. The Sense 6 is comprised of mesh material, and the XA Amphib is comprised of a durable plastic material. That being said, these two are some of my most worn shoes. 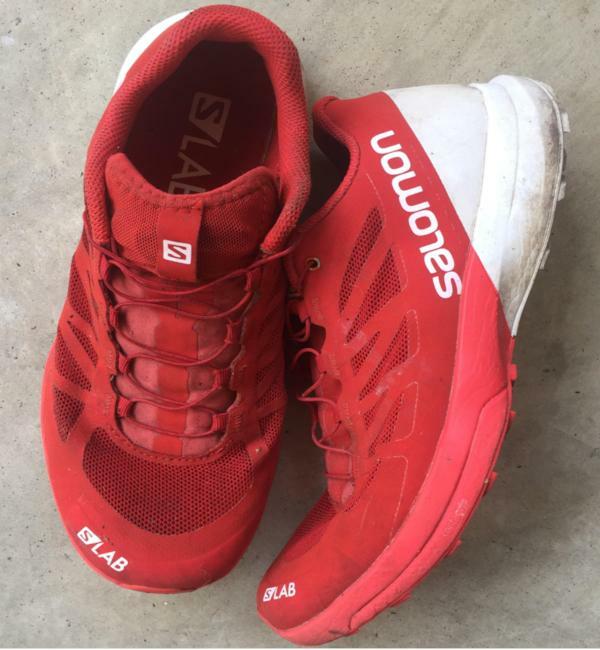 The S-Lab ultra is the shoe Salomon designed for long-range distances, and because of that, it has more cushion making it substantially heavier than the Sense6. These trail shoes are designed for hard ground and speed for mid-range distances. They are top of the line trail shoes and can perform well during long distance races. However, they do put some strain on the calves, which requires some adjusting to. These shoes are outstanding on hard ground trails. They can be used on the road, but the lugs will wear down quickly. They also perform decently on soft ground and mud, but it is not advised due to the minimal lugs and traction. Hard ground trails - Yes, this shoe will definitely enhance your trail running. Soft ground trails - You can; however, the Salomon 6 SG would be a better option. On road - Shockingly these shoes do great on road, but the tread will wear down quicker. For speed - Yes, this shoe was made for fast running. For distance - Yes, however, be mindful of the mindful cushion. The Salomon S-Lab Sense 6 is one the best trail running shoes I have ever worn for hard ground trails. They offer a minimalistic approach to running while staying comfortable. The only real issue I have had with this shoe is the strain on my calves and Achilles with consistent use and high mileage. I personally would not use this shoe for any distance over 50k due to the minimal cushioning. There are more cushioned options such as Hoka or an S-Lab Ultra that are a more suitable option. I have put in over 75 miles in these shoes, and they show no sign of wear and tear. Overall, I highly recommend these shoes, and they are usually my first choice for hard ground trail running and racing. Thank you, Salomon, for making the ultimate trail shoe. I ran over 100 miles in the shoe I've already on a variety of surfaces and I've had no problems with the tightness of them. Overall I really like the shoe. I'd recommend trying it if you can afford it. The 6th iteration of the Salomon S-Lab Sense features a quick-drying, breathable mesh that provides the foot with a well-ventilated environment. The single-layer mesh is very Iight and durable enough to withstand the damaging nature of the trail. For a reliable grip while running on varied terrains, the Salomon S-Lab Sense 6 features the Premium Wet Traction Contragrip®. This outsole technology provides the non-slip traction needed for technical trail running. The S-Lab Sense 6 just like its latest version, the S-Lab Sense 7 is a unisex trail running shoe that has a standard running shoe length. It is available in men’s sizing. Women who want to purchase the shoe must go one size larger than the equivalent men’s size to get the right fit. The shoe is available in a standard medium width. Similar to the well known Salomon Sense Ride 2, the outsole of this shoe utilizes the Premium Wet Traction Contragrip® technology. It is specifically designed to deliver non-slip traction on wet and muddy surfaces. It also provides durability to the sole unit of the shoe. It also features the OS Tendon that mimics the function of the actual foot’s tendon. This provides flexibility and balance for a smoother heel-to-toe transition. The shoe uses a dual-density compressed EVA midsole foam that it engineered for a long-lasting cushioning. This midsole foam remains lightweight while providing better shock absorption and high-energy return. Strategically inserted in the midsole of the Profeel Film technology. It is a thin TPU film that provides midfoot support while keeping the ground feel the same. It also provides consistency in the midfoot and encourages are more powerful toe-off. On the upper of the Salomon S-Lab Sense 6 is a single-layer quick drying mesh. This material provides the foot a breathable coverage all throughout the run. The durable nylon layer also provides protection for the upper’s high-wear areas. The notable Endofit™ technology from Salomon is also present. It is an internal fit sleeve that hugs the foot comfortably for an enhanced feedback and sock-like fit. Along with the Endofit™ are the Sensifit overlays that have a seamless design. It encompasses the area the midfoot area. The overlays are designed to provide a snug and secure fit. To keep the toes well-protected while running on the trail, the shoe utilizes a durable rubber toe cap. Lastly, the lightly padded tongue and collar of the shoe offer an enhanced fit and added foot security, keeping the foot in place while running. The tongue also keeps small debris and stones from getting into the shoe.